Last Gasp logo designed by Spain Rodriguez. 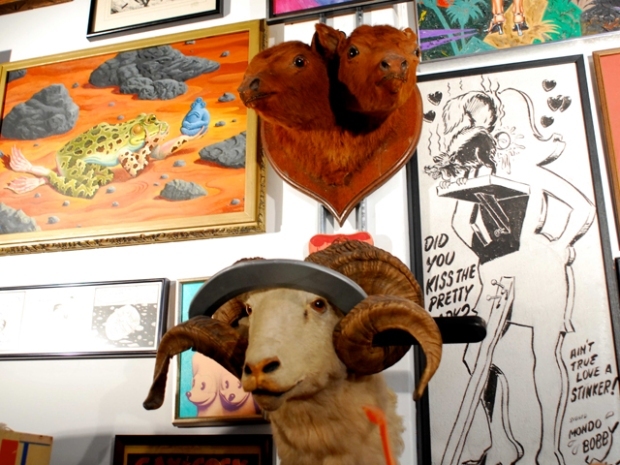 Last Gasp will celebrate its 40th anniversary with an art show called Last Gasp: A Who's Who of Lowbrow Art. The show opens Thursday April 1st at 111 Minna in San Francisco. Last Gasp publishing is known as the world's oldest and largest publisher of underground art and tonight, April 1, it celebrates 40 years in business. For forty years, Last Gasp has etched a deep history publishing art imbrued with the dissonance and elegance of a counter cultural art world. It’s also slipped the occasional educational title into the mix, with lessons on how to treat herpes, or confronting racism. Just last week publisher Ron Turner lumbered past shelves of books – climbing on all sides to the ceiling. Looking something like a hippy version of Santa, he paused to check the day’s orders before plopping down in a desk cluttered with a strange cacophony of books and artifacts. Turner rattled off a few phone calls then checked his Facebook account. Everywhere, the walls of his legendary Last Gasp publishing house were emblazoned with the vintage sideshow posters he came to appreciate as a child. It’s only natural Turner would spin a career from his affinity for outsiders and freaks. Last Gasp’s artist roster is a who’s who of underground artists like R. Crumb, Justin Green and Robert Williams. Turner’s love of the subversive is as enormous as his passion for the beautiful, the freaky – the stick-it-to-the-man kind of art. This artful nose thumbing got its start back in the sixties, when Turner was a Bay Area college student studying ecology. The ecology program was struggling for funds, and Turner and a few friends figured they could raise money by creating and selling an underground comic book. “We thought underground comics were the strongest visual, vehicle for ideas at the time,” Turner said. Turner’s first foray into the art world was a comic called Slow Death Funnies, featuring works by a number of burgeoning artists like R. Crumb. Turner and his friends came up with a batch of names for their new comic. Last Gasp was leftover, so he commandeered it as the name of his new company. Turner has never outgrown the hippy ideals of his youth when he would protest the war-du-jour or the treatment of farm workers. Each Christmas he throws a party in Last Gasp’s offices, with the proceeds going to charity. Rodriguez said Turner and Last Gasp have not only boosted the popularity of underground comics and art, they’ve also created a venue for underground artists to make a living. ”It’s been key to the production of underground comics and just providing some forum way that comics can get out there,” Rodriguez said. Turner doesn’t just publish the unusual art he loves, he also surrounds himself with it. He unbolted a padlocked iron door in the rear of Last Gasp’s headquarters in San Francisco’s South of Market.. The door came from Alcatraz, he explains. Every inch of the room is covered with stuff – R. Crumb’s original comics for the Slow Death Funnies, a life size Bruce Lee statue in full karate pose, two vintage pinball machines -- a stuffed two-headed calf’s head. The collection speaks to Turner’s love of outsiders. He rifles through a collection of clown paintings made by in prison by mass murderer John Wayne Gacy. But for all his love of the strange, the unusual, the misfit castoffs --- Turner’s philosophies sound strikingly new-agey. Note: Last Gasp will hold its 40th anniversary party at 111 Minna in San Francisco on April 1st at 6 p.m.